The discovery of the canopy as habitat of a highly diverse fauna in the 1980s was a result of the use of a new method to collect arboreal arthropods – the insecticidal knock-down or canopy fogging (Erwin 1982). This method allows to collect arboreal arthropods with hitherto unprecedented accuracy and opens up a completely new perspective to investigate the diversity of tropical forests. One astonishing result was that perhaps half of all species and millions of individuals, which belong to different functional groups, live in the canopy. This fauna has been and still is almost completely neglected in ecosystem analysis. This is likely to be a key reason for our still rudimentary knowledge of how these ecosystems function. The canopy fauna was so surprisingly rich that the hitherto assumed 1.7 million species on earth were estimated to reach at least 30 million species. Until today, this figure is discussed very contrary. Despite these rather spectacular results canopy research has made little progress until today (Caley et al. 2014) which is difficult to understand because there are now efficient collecting methods available (Floren 2010). 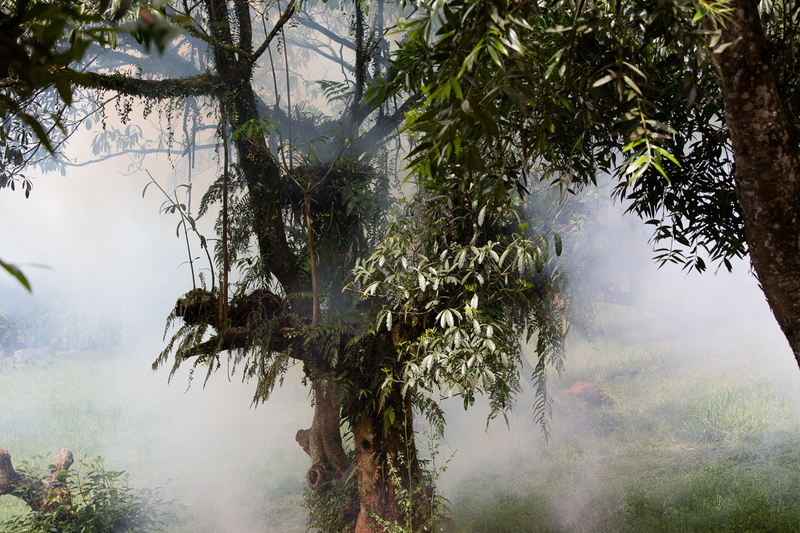 Canopy fogging achieves probably the best results when tree specific arthropod communities, their diversity, structure and dynamics are in the focus of research. Unfortunately, the continuing destruction of primary forests limits the time available to investigate the extent, distribution and functional importance of the canopy diversity. This knowledge is indispensable for re-establishing natural forests, however. Our research on Java is the first comprehensive study of arboreal arthropod diversity in Indonesia and a foundation stone for future analyses of these most diverse terrestrial ecosystems on earth. Caley, M. J., R. Fisher, and K. Mengersen. 2014. Global species richness estimates have not converged. Trends in Ecology & Evolution 29:187-188. Erwin, T. L. 1982. Tropical Forests: Their richness in Coleoptera and other arthropod species. The Coleopterists Bulletin 36(1):74-75. Floren, A. 2010. Sampling arthropods from the canopy by insecticidal knockdown. Pages 158-172 in J. Eymann, J. Degreff, and C. Häuser, editors. Manual on Field Recording Techniques and Protocols for All Taxa Biodiversity Inventories ABC Taxa.